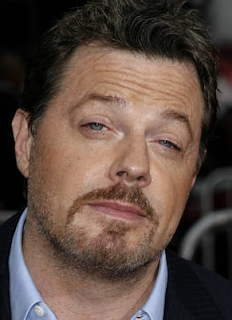 Eddie Izzard has many claims to fame. He’s a well-regarded comedian, a terrific actor in such programs as FX’s "The Riches" and, of course, he’s probably the world’s most famous out-of-the-closet heterosexual transvestite. Oh, and he’ll be playing Vegas on July 25-26 at the Palms, so Steve chatted with Izzard about all of those things—and Izzard makes Steve a "Rich" promise that will delight many. In Banter: Wynn takes on the blogosphere, why Steve has tampons, is this woman pregnant, why won't Dave Schwartz change his hours, put that snake away and all hail that great philosopher Laura Bush! KVBC-TV's Steve Crupi reported last night a terrific scoop -- the Review-Journal doesn't even have it today -- that the Trump International Hotel & Tower is in such doldrums they're firing 73 employees. That's a fifth of the workforce. Me thinks this is more proof that they'll never build the second tower in the image used below behind the anchors. Gee, what's that I wrote in the Weekly just last week? Oh! That's right: "We in the media will also be writing many stories in coming years about the struggle of this property. It is the best-executed version of the worst-considered idea in Vegas today." Crupi reports that the layoffs are due to the lack of closings caused by the mortgage meltdown. But didn't Mr. Trump tell Howard Stutz in the Review-Journal a month ago: "Some of my buyers are richer than the banks! We're working with people and I think we're doing pretty well!" Ya don't say. If it wasn't for her hubris in talking smack about another project when she had to have known they were facing a rough road themselves, I might not rerun this quote so often. As many of you know, I reported from Beijing in 2001-02. Among the most exciting experiences of my journalistic career, in fact, was filing the story I'm linking to here to USA Today on a cell phone from Tian'anmen Square the night the Chinese were awarded the 2008 Games. That celebration was thrilling and my ability to describe it amid the pandemonium was a great moment in my life. 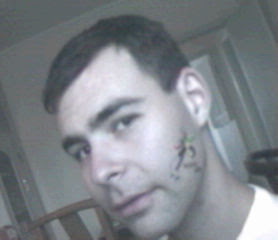 That's me here with the Beijing Olympic sticker some Chinese woman insisted on putting on my face. God, I look young. It was exciting, but it didn't mean I believed giving China the Olympics was smart. And as we round the corner to the realization of that moment -- as China reneges on its promises to allow greater civil liberties, to permit unfettered access to the foreign media and to improve its environmental record -- I returned to my archive. Below is an op-ed piece I wrote that ran in six major U.S. papers in July 2001, including the Philadelphia Inquirer seven years ago today. It also appeared in the Baltimore Sun, San Francisco Chronicle, Hartford Courant, Pittsburgh Post-Gazette and Cleveland Plain Dealer. I'm struck by how prescient I was. Not everything is accurate, but an awful lot of it. BEIJING: Filthy air. Undrinkable water. Natives hocking wads of phlegm on the sidewalks. Roads crammed with incessantly honking cabbies who can't speak English and refuse to run their air on blistering summer days. Sure sounds like a place to hold an Olympics. For a moment, set aside the human-rights problems in the world's most populated nation. Forget about the Tibetan Buddhists and Chinese Catholics, both of whom have seen the Communist regime take over their religions and install leaders of their own. Ignore the fact that 150 million people live on the streets because, having been born in the countryside and being thus prohibited from ever living in the cities, they've flocked there anyway undocumented to find work. And don't even mention the mowing down of the liberty-seeking thousands in Tiananmen Square in 1989. Old news. Get over it. The International Olympic Committee did. And now, despite the obvious flaws that few can miss when they visit, the world will descend upon Beijing in 2008 for some good ol' apolitical athletic activities. Yet, when the free champagne stops flowing and the local "media" return to their typical mouthpiece duties of bashing the United States and Japan, those who were swept up in rooting for this accomplishment may wake to the reality that this could be a huge fiasco. The odds are this country will fail. Perhaps that's why the Bush administration and Congress opted not to actively oppose the Beijing bid in the end. If China does well, it will be because it spent the next seven years becoming more like America. If it doesn't, the world's only aspiring superpower will have vanquished itself, and the United States can rest on its laurels again. There are many lovely people and places in Beijing. It is true that China is changing - rapidly and for the better. And the Chinese people are unfairly misunderstood across the globe, certainly by those who imagine an overt police state with soldiers on every corner. But this remains a rugged place to visit, a place where people casually clear their throats onto the sidewalks. Where grubby children as young as 5 run amok at 2 a.m. outside the bars that cater to Westerners begging for morsels. Where sunrises and sunsets are impossible to see behind a sheen of smog that makes Los Angeles seem pristine. It is a dirty, still unmodern town, not a place to go out in your fur and pearls. Heck, you can hardly even find a Reese's Peanut Butter Cup. Much has been made of the fact that China started preparing for the 2008 Olympics earlier than anybody else ever has, but it also has an awful lot to fix. This has to be the first time the IOC has awarded the Olympics to a place based on the entirely different city it promises to become from what it was when it was selected. Seven years hardly seems enough time for the transformation Beijing claims to have in store. Yes, they've budgeted $22 billion for roads, facilities and environment efforts, which sounds like a lot, but this sprawling city has 13 million people in it - think Chicago times four - a healthy percentage of whom walk past mounds of decaying, unbagged trash in their alleys to get to their outhouse shower. More than likely, China's answer will be to attempt the typical sleight-of-hand that got it this far. The IOC apparently didn't notice, for instance, that the government ordered a shutdown of all factories during its assessment visit in February, magically producing blue skies. It also painted the dead grass green outside the IOC hotels, giving off an unnaturally verdant image for a city then in the throes of a bitter winter. The Olympics will be different. They can't shut down the factories for two whole weeks to clear the air. They can't send every cabbie to charm school. (Driving school should come first, anyway.) And, truth be told, they cannot fix traffic problems so that racing from a hotel at the center of town to the badminton competition will be pain-free. It was heartening to witness the spontaneous, genuine celebrations in Tiananmen on decision night and to listen to the Chinese people rejoice that they've finally earned the respect of the world. China scholars and economists will say that China's entry into the World Trade Organization later this year will have a more significant, longer-lasting impact on the nation's future and place in the world. But WTO entry won't stoke national pride like this, won't garner President Jiang Zemin, widely disliked by the average Chinese, the sort of adulation he enjoyed when waving from the veranda of the entrance to the Forbidden City that night. Indeed, what is now heartening could turn heartbreaking. Neither the people nor their government has any idea what they're up against, the enormous risk they've taken, the price they could pay for humiliation in 2008. That said, look how far they've come in a dozen years. On July 13, hundreds of thousands of people again assembled in Tiananmen and they declared this an historic moment, a moment of great progress. It was hard to disagree since there wasn't a single tank in sight. I don't really know why I get these emails from MGMGrand.Com since I'm not a member of any slot clubs in Las Vegas and so I have no history of staying or playing with this or any other resort. Well, I suppose some of it could come from the fact that Miles and I stayed at almost every place in the Strip for Conde Nast Traveler several years ago for a special Vegas section I wrote, but I don't get everybody's stuff. Only, at least in the MGM Mirage world, MGM Grand's. 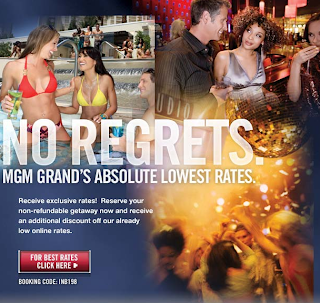 Anyhow, in light of recent events related to MGM Grand, their website and an offer they decided to refuse many of you, I wondered about the boast above. Is this REALLY the "absolute lowest rate" or is it the "absolute lowest rate unless you're one of our special customers to whom we'll send a different offer?" If there are any lower rates out there, is this false advertising? "MGM Grand reserves the right to cancel or modify this promotion at its discretion and without prior notice." The Strip is LIVE tonight with British comic actor and famed transvestite Eddie Izzard, who performs his stand-up at the Palms' The Pearl this weekend. We'll also be chatting about Steve's night at Diablo's and Noir, Wynn's big splash and Lake Las Vegas' woes and we'll have some odd little audio clips to share from a couple of other podcasts. P.S. We lied by accident last week. The Steve Lawrence interview will air next week. So sorry. Is This The Great Depression II??? If you can't read it, that headline announcing the resort is hiring 5,300 people claims that "state and national unemployment rates reach record highs." Now, I hadn't heard THAT. In the text, they mention Nevada unemployment is at 6.4 percent, the highest since 1994, but even a city as young as this one has to know that that's not all-time. That's just 14 years ago. And nationally, unemployment is at 5.5 percent. Not a record. Or near one. No, it's not a "mental recession," but still. I just wonder why the Wynn folks needed to gussy up something that is already pretty good news for a lot of people, that someone in Vegas is hiring 5,000+ people. Here's the video news release they created in hopes that TV stations will use it within alteration. Believe it or not, many do. Elaine Wynn, of course, looks terrific. I noticed they didn't have any dealers in there, hmm? Gotta drive to Kingman now. Will be gone all day. Behave, everyone. If you want to go work for Wynn and, perhaps, avoid the bread lines, click here.